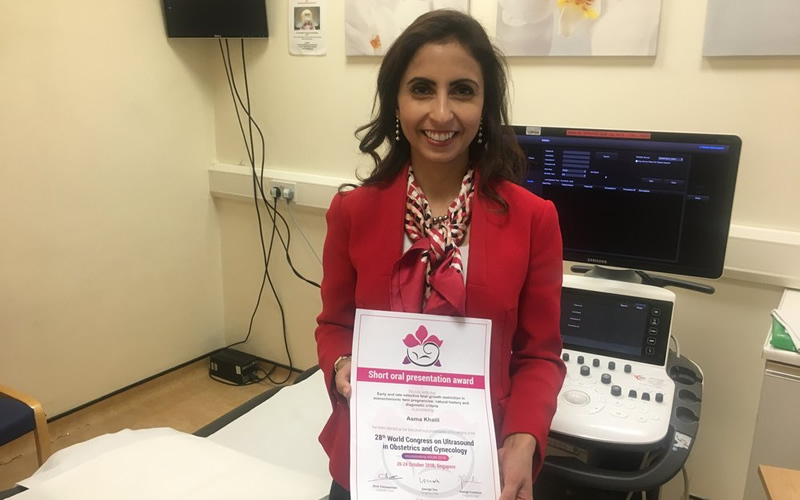 The maternal fetal medicine team and I won an award at the 28th World Congress of the International Society of Ultrasound in Obstetrics and Gynaecology last month. The team were awarded for our research on twin pregnancies complicated by selective fetal growth restriction. The research focuses on the risk of stillbirth in the twin pregnancies where one twin is much smaller than the co-twin. We also investigated the risk of developing twin-to-twin transfusion syndrome – a rare but life-threatening condition that affects 10 to 15 percent of identical twins that share a placenta.